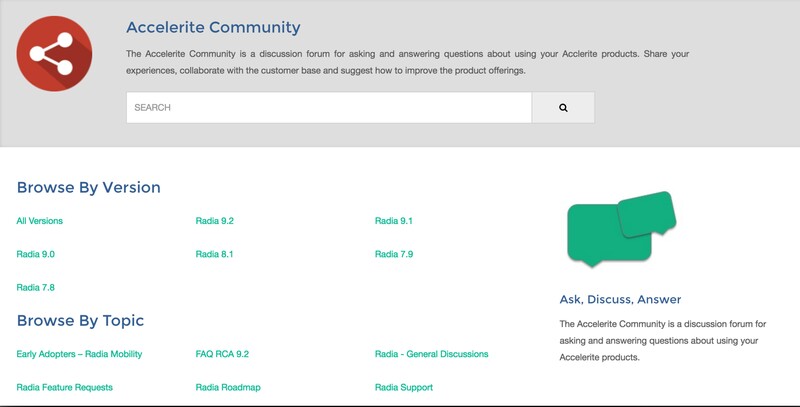 Our Help & Support Forums are a great place to find answers about your Accelerite products. The forums are attracting more and more visitors each month and comments have been more frequent.Since last year’s Radia User Summit, the views of topics have more than doubled as compared to the first half of 2015. The forums give you a place where you can learn from your fellow users; it’s great to see the community collaborating. In late 2015 we took the decision to organize the forum content with a view to help you find answers and solve problems faster. For Radia the content can now be browsed by product version and by topic. We love feedback and we hope the community search and navigation pages are helping. The forums aren’t just a place for seeking out solutions on your own. This peer-to-peer community contains thousands of active users; many answer questions and contribute to the discussions. If you visit the portal and are unable to get an answer yourself or with the help of fellow customers, a member of our support team can help you solve your problem. Just log a support case and we are always ready to help. As with any community, it's the members that count. In 2017 and beyond, we'll be adding other features like badging and gamification to the forums so we can harness the collective wisdom of the crowd by encouraging more visitors to log in and offer solutions. We want you to be able to find help whenever and wherever you want. We’re working hard to make it easier and faster for you to find solutions to your questions and service issues. So next time you have a question, check out our forums; they might already have the answers you're looking for. Accelerite is planning to run a training class from its office in Santa Clara in April 2017. If you or your colleagues would like to attend the class we would love to hear from you. Please send an email to sales@accelerite.com. The class will be based on Radia 10.0 but will be relevant to anyone using Radia version 9.x thru 10.